Clinical treatment approach of a child with molar incisor hypomineralization (MIH) combined with malocclusion. Introduction. Molar incisor hypomineralization (MIH) was defined as "hypomineralisation of systemic origin of permanent first molars, frequently associated with affected incisors". MIH includes the presence of demarcated opacity, post eruptive enamel breakdown, atypical restoration. Тhe approach to management suggested: risk identification, early diagnosis, remineralization for prevention of caries and post eruption breakdown, restorations. The clinicians very seldom notice that children with MIH usually have both- hypomineralisation and malocclusions, and they do not discuss combine treatment plan. Aim. To present our interdisciplinary approach to a patient with MIH, combined with malocclusion. - Occlusion was raised with occlusal restorations (inleys) and orthodontic appliance. Medialisation of mandible and holding maxillary growth with functional appliance and occipital EOA until class one occlusal relations. Conclusion. Children with MIH should be examined and treated complex in collaboration with orthodontist and if necessary by other specialists too. Key words: Molar incisor hypomineralization (MIH). 24. 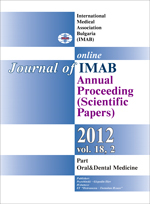 Willmott NS, Bryan RA, Duggal MS. Molar-incisor-hypomineralisation: a literature review. Eur Archs Paediatr Dent. 2008 Dec;9(4):172-9. [PubMed].